Click to increase size of graphic. The mission of the Assessment, Data, and Evaluation team is to promote data-driven improvement and decision-making that enables students and staff to reach their potential. This work is guided by the principles of collaborative inquiry to facilitate action within each phase of the continuous improvement cycle. Planning: Developing data-based action plans and goal (target) setting. 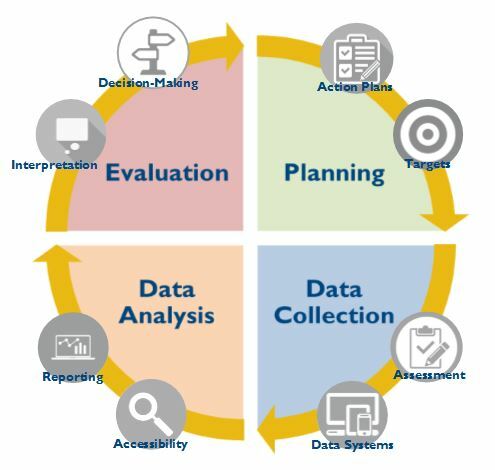 Data Collection: Collecting data through assessments and data information systems, which includes data organization, storage, interoperability, and communication. Data Analysis: Facilitating data access, analysis, and reporting. Evaluation: Supporting the interpretation of data and informing actions and improvement. The Assessment, Data, and Evaluation office also completes several district, state, and federal reports throughout the year, including the Annual Progress Report (APR), Comprehension School Improvement Plan (CSIP), Student Reporting in Iowa (SRI), BEDS, Civil Rights, and Every Student Succeeds Act (ESSA) reporting. For district Assessment, Data, and Evaluation resources please visit data.dmschools.org. The Assessment, Data, and Evaluation office reviews all internal and external requests to conduct research in and of the district. All research applicants must complete a research application. Questions regarding research applications should be directed to research@dmschools.org.